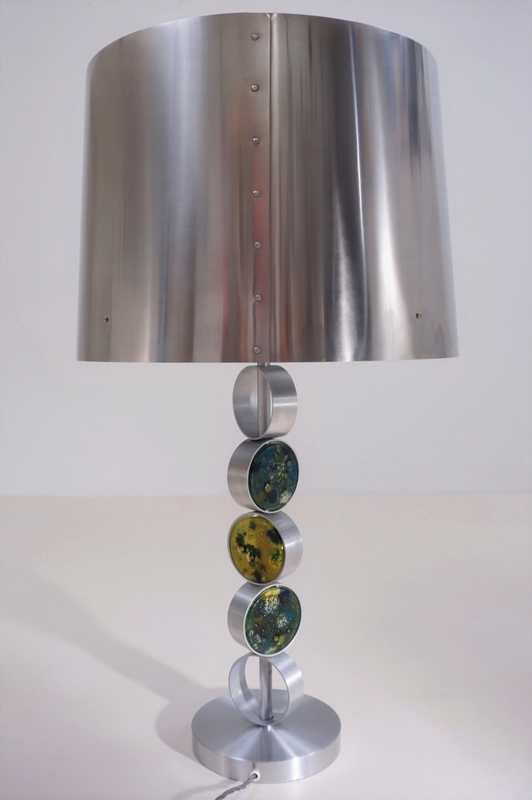 RAAK table lamps, large complementary pair, aluminum, steel & glass, 1972, Dutch. 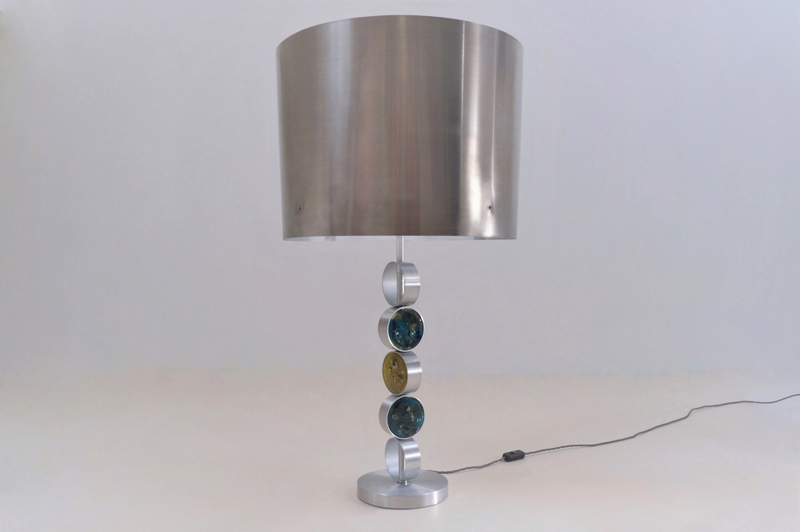 This is most likely a design by Nanny Still, one of the most famous designers at RAAK Amsterdam.This pair of table lamps have been gently cleaned while respecting the vintage patina. Both are newly rewired & earthed, fully working and PAT tested by an electrician. Each has a new E 27 nickel metal earthed lamp holder, black switch, grey silk cable & new black plug. Light bulbs included. It is possible to use these lights in other countries although it may be necessary to purchase different light bulbs suitable to local electricity. They can be used with a dimmer. 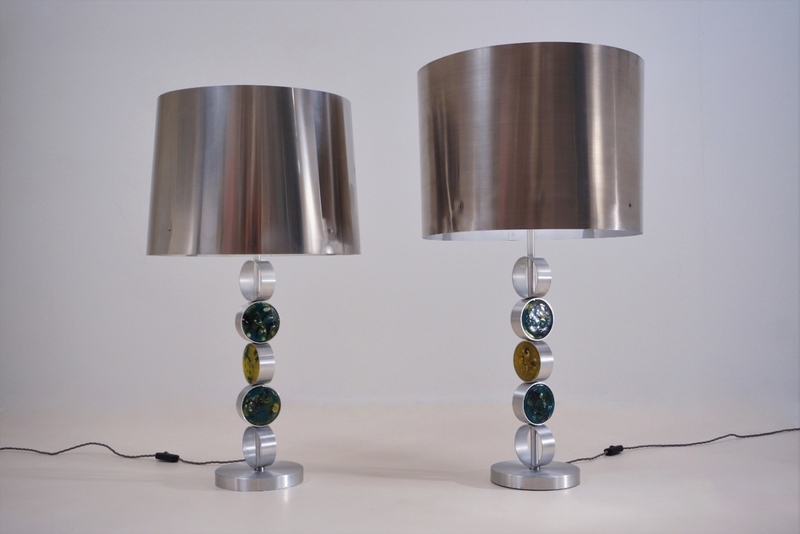 This pair of large table lamps combine Modernist & Brutalist influences in the design. Complemented with the addition of handmade coloured glass panels that soften the look and add glamour. 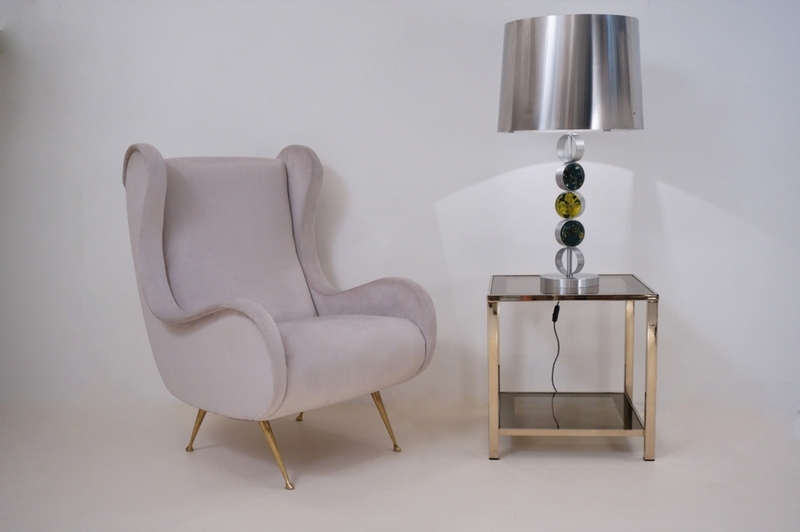 They literally make a `huge` decorative statement and would suit a range of Interiors such as Mid-Century Modern, Art Deco, Hollywood Regency, Brutalist, 70`s Glamour, Post Modern, Industrial or Contemporary. This set of lamps are the same design but not exactly the same size. The materials and details are both the same. The base size, central column with number, size and position of discs is the same. 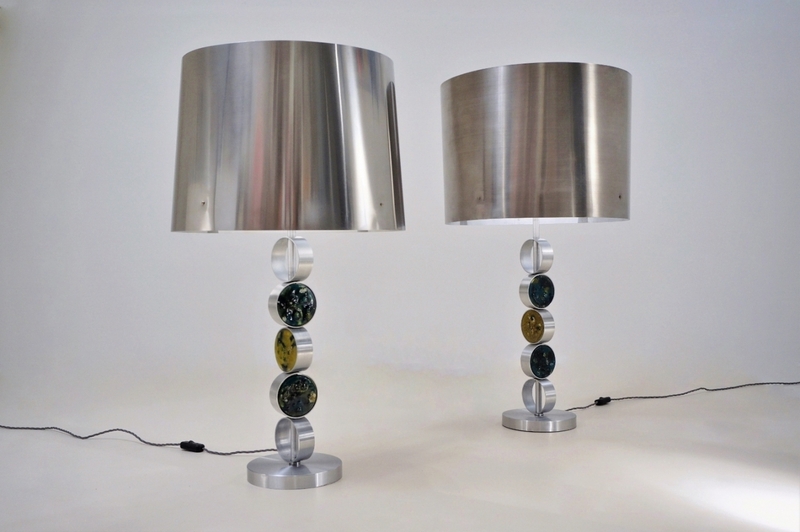 The only variations between the two lamps is that one lamp has a slightly conical shade and the other is slightly taller with a cylindrical drum shade. 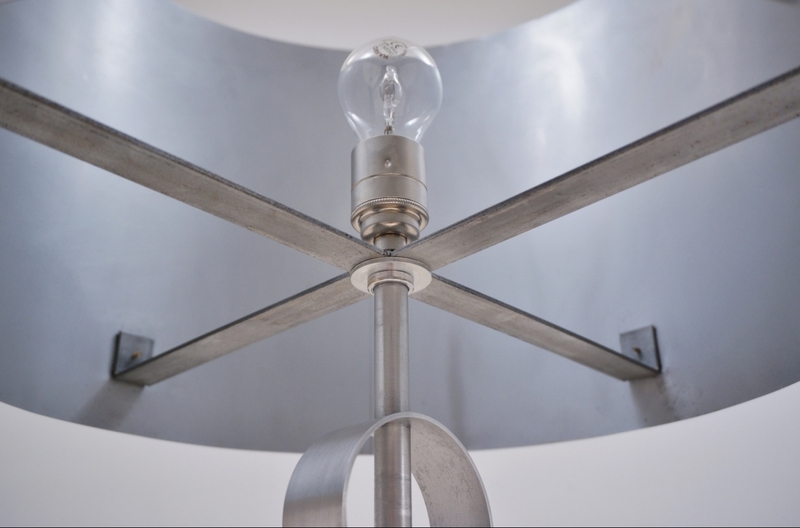 Each lamp consists of 3 parts: a stainless steel hood, a central column with a combination of aluminium discs & coloured glass, and an aluminium base. 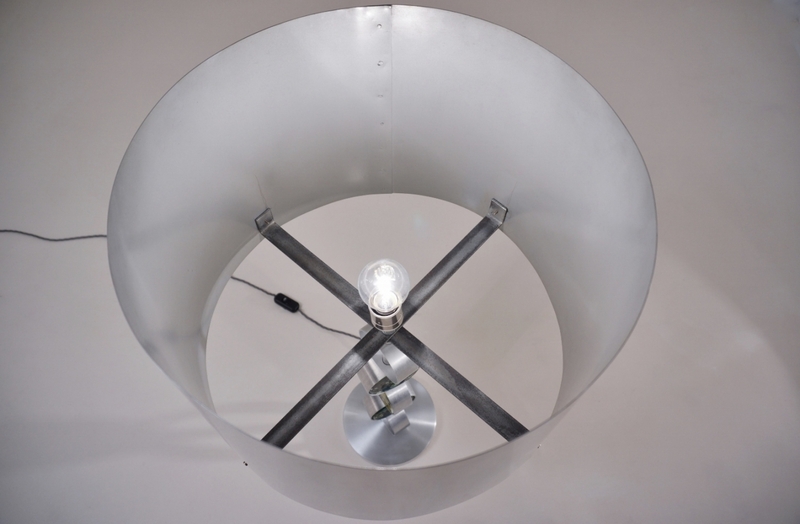 The round base is in brushed aluminum and weighted on the underside which makes these lamps very stable. From the base rises the central tubular aluminium column. 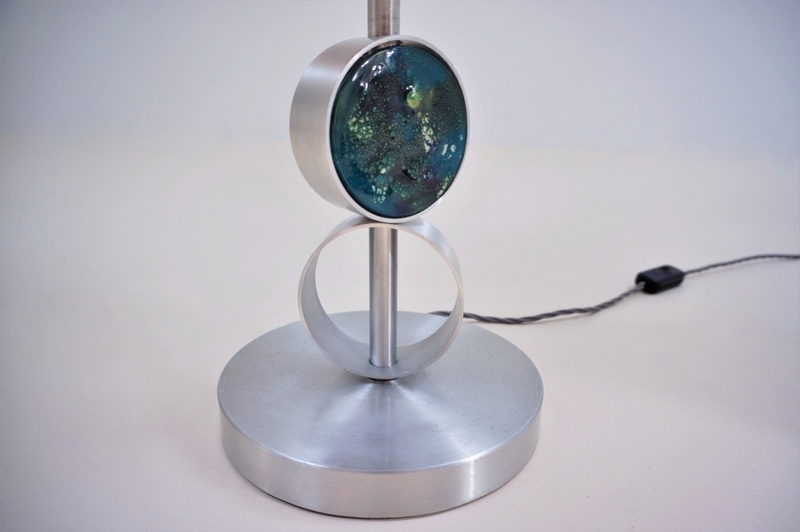 This is decorated with a series of 5 aluminum rings. The top and bottom are empty circular frames. 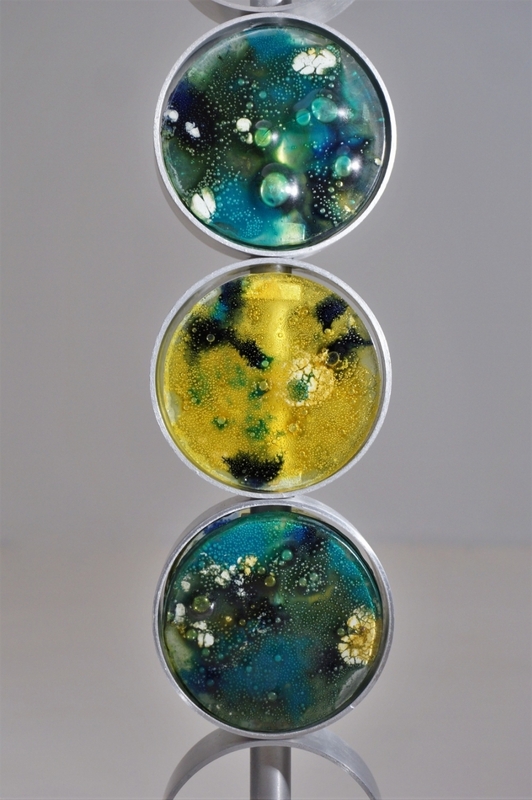 The 3 rings in the middle hold hand made coloured glass panels. Each of these 5 rings rotates 360 degrees and can be placed in different positions, as well as move up and down the main vertical column. Each section with glass is composed by 2 round glass panels of the same colour fitted at either side of the aluminium round frame. The diversity of texture, effect and colour is exceptional. 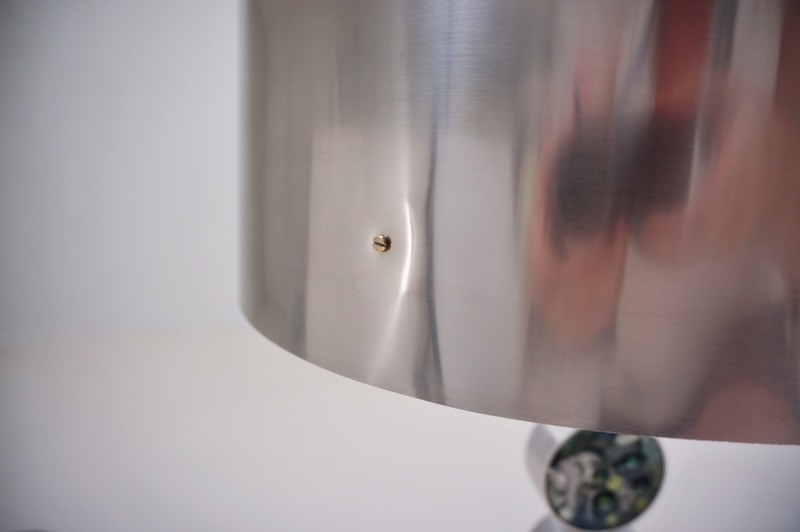 At the top of the column there is the stainless steel shade with a brushed texture. 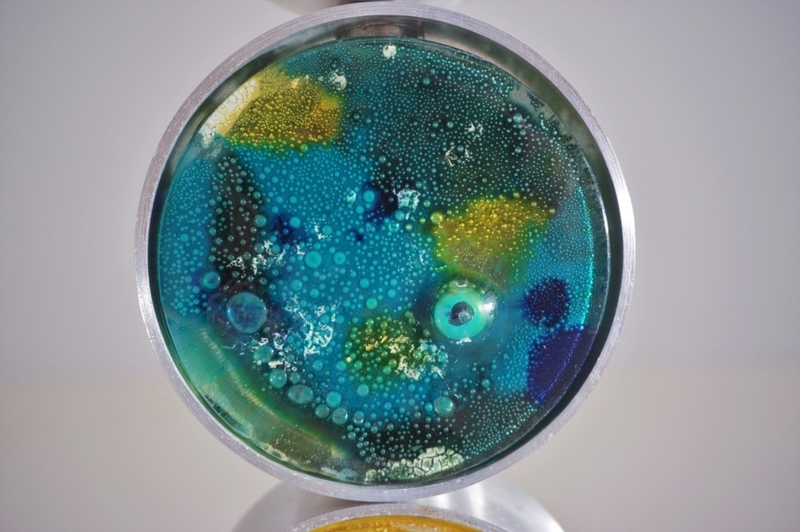 Inside it is lined with zinc alloy. Interestingly the joint in the shade is finished with a flat head bolt which contributes to the B rutalist design. The shade is stable, fitted to the main column by two iron stretchers. The shade is screwed to the 4 ends of these arms. 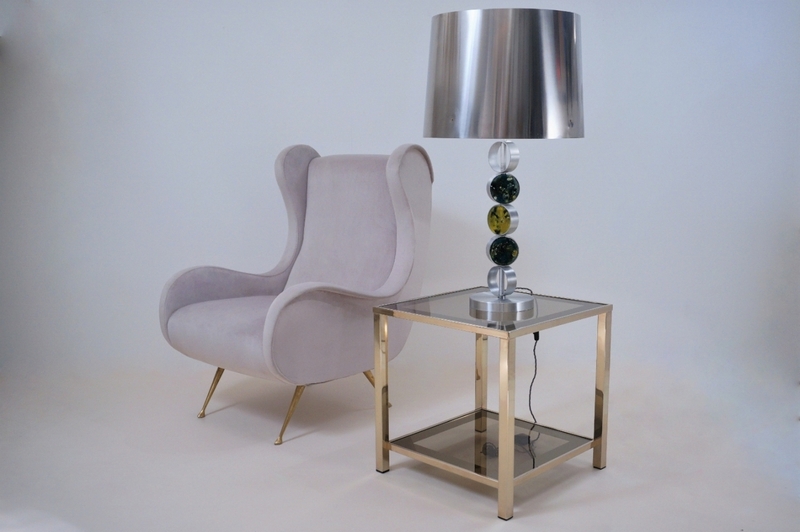 These large vintage table lamps are in very good condition. All the glass panels are original with no chips. 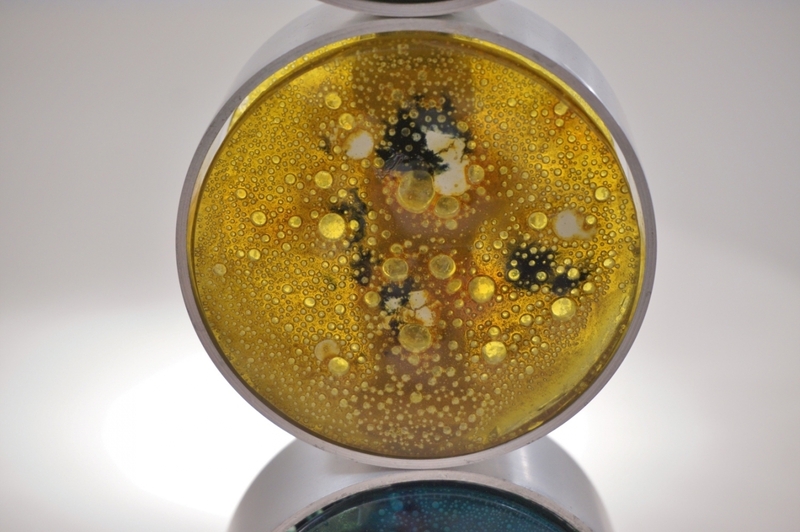 The glass does have the natural irregularities characteristic of Art Glass. The brushed aluminum base is in good condition with no dents and only superficial marks in line with age. The stainless steel shades are in very good condition and sound, with minor superficial marks and tiny dents where they fit to the stretcher as photographed. Packing is offered free of charge. We take special professional care while packing. For safe transport each lamp would be packed with layers of foam & bubble wrap and boxed, ideal for shipping with a courier. 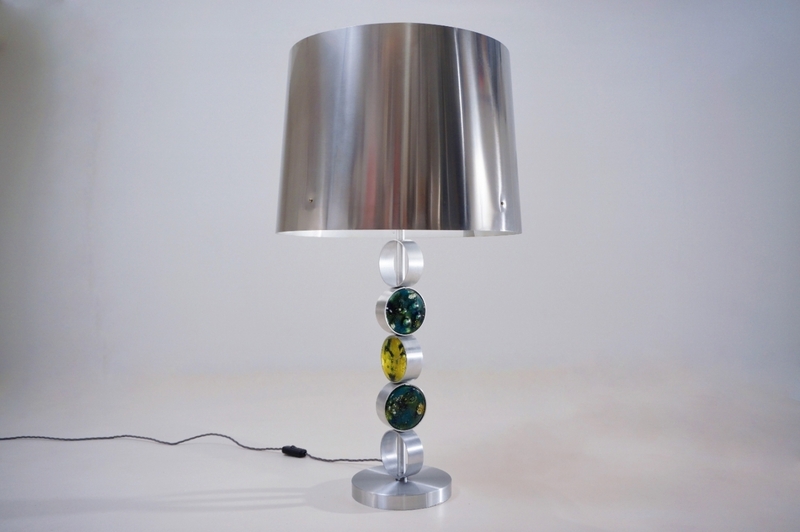 Additional dimensions The shorter lamp has the following dimensions: Total Height: 80.5 cm, Width: 45 cm, Depth: 45 cm, The shade is: Height: 32.5 cm, top Diameter: 45 cm, bottom diameter: 40.5 cm The base is: Height: 2.7 cm, Diameter: 19 cm The tal ler lamp has the following dimensions: Total Height: 86.5 cm, Width: 48 cm, Depth: 48 cm The shade is: Height: 35 cm, Diameter: 48 cm The base is: Height: 2.7 cm, Diameter: 19 cm NANNY STILL-MCKINNEY BIOGRAPHYNanny Still-McKinney (1926-2009) studied at Finland’s Central School of Arts and Crafts in Helsinki. Already before her graduation in 1950, she started working as a designer for Riihimäki Lasi, at that time Finland’s largest glass factory. Still’s work was on display on the Milan Triennials of 1954, 1957 and 1960. So when she joined the design team of the Dutch lighting firm Raak in the early 1960’s, she had already established an international reputation. Her lighting designs for Raak display the same kind of qualities as her work for Riihimäki: they are colorful and decorative, rather individual than modernistic.